Former Red Hot Chili Peppers guitarist John Frusciante and Omar Rodríguez-López from The Mars Volta have teamed up for a new album, and here's the best part: they're giving it away. 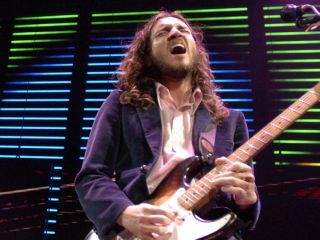 Apparently, the 30-minute instrumental offering, titled simply Omar Rodríguez-López and John Frusciante, was recorded "many years ago," according to the duo, and while a few tracks such as 0 - yes, that's the name - have leaked out, most of the songs have been unreleased until now. The album is part of a regular series of collaborations initiated by The Mars Volta guitarist and is available for download at his website. It's totally free, but fans are encouraged to donate whatever they can to the Keep Music In Schools charity. The recording will also be made available for purchase on CD and vinyl later this year. In related news, Frusciante, who left the Red Hot Chili Peppers last year, has a new band called Swahili Blonde. The lineup, so far, consists of Frusciante and percussionist Nicole Turley (of Weave). But Duran Duran's John Taylor is said to pop up, along with Alina Meyer and her father, Devo's Alan Meyer. You can hear a few tracks from the group's debut album, Man Meat, on their MySpace page.